Well, here we go folks...we have waited long enough, but college football is back. Now, it's time for the first Big East Weekly preview. West Virginia and UConn took top honors last season, but the likes of South Florida, Rutgers and upstart Pitt should be in the mix as well this season. A light schedule mostly for week one, with the feature game coming from New Jersey, as Rutgers hosts Fresno State. Hofstra at UConn. A good game for Tyler Lorenzen and company to start the season with. Lorenzen, who threw for over 2,00 yards in his junior season...is poised for a solid final year in Storrs. Hofstra was 7-4 last year in D-AA, but should be outmatched. Look for Lorenzen to go for a pair of scores, with Andre Dixon and Donald Brown contolling the ground attack. Eastern Kentucky at Cincinnati. Ben Mauk or no Ben Mauk the Bearcats will roll. The NCAA will continue to deny every appeal that Mauk throws at them, so it's time to start talking about Dustin Grutza as the leading gunslinger in Cincy. Grutza has compiled 24 touchdowns over his three years of play...but 23 ints goes along with that. Eastern Kentucky had a solid year in 2007, including a perfect conference record in the OVC. However, Cincy's defense should be able to limit the Colonal rushing attack. Bowling Green at Pitt. Okay Coach Wanny...this is the year you are supposed to be competitive. Are you going to step up to the plate, or will Panther fans wish you still coached the Dolphins? Having LeSean McCoy should help the Stache's cause. Question mark still at quarterback, but McCoy and a legitimate defense will keep them in the mix...at least early in the season. Bowling Green proved to be a tough squad last year, until they were blown out in their bowl game against Tulsa. A stingy defense decided to take that week off. Tyler Sheehan will have an opportunity to show his stuff against Pitt...it just won't be enough. Syracuse at Northwestern. The battle to see which school has the better journalism department...that may be a better matchup. This won't be. Greg Robinson will kick off his final season with a loss to the Wildcats. Tyrell Sutton will not be contained by a Syracuse defense that is just abysmal. Well, the hole team is. Enjoy last place again Orange. Villanove at West Virginia: Brain Westbrook isn't walking through that door Nova. Neither is Tim Thomas. Neither could help the 'Cats against the conference favorite Moutaineers. 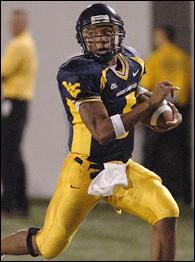 Pat White, Noel Devine...well thats about all that needs to be said. Tennessee-Martin at South Florida. The Skyhawks may have an awesome name, but they don't have an awesome team. It's not even a good team. 4-7 last year in the OVC won't cut it against George Selvie and co in Tampa...which is quickly becoming a very difficult place to play. Expect a blowout. Kentucky at Louisville. The battle for the Bluegrass State could be quite entertaining. The Wildcats will be dealing with a new quarterback in Mike Hartline. Hartline will still have Dicky Lyons to throw to...that's if Lyons hasn't tranferred to Georgia yet (see last year's SEC media Day for that reference.) Lousiville is dealing with a new QB as well, but Hunter Cantwell has the experience to step in for the departed Brian Brohm. The Cardinals will be relying on a lot of junior-college transfers to step in to help this team win. It will be a shootout, with the home team prevailing. Game of the Week: Fresno at Rutgers. Fresno loves to score and will be able to against the Knights. Pat Hill will bring a well-balnced attack to the east coast, and put serious pressure on the Rutgers defense. The run attack may be too much. What is Fresno lacking? A proven defense, which will keep Mike Teel and the Rutgers offense moving. The big difference could be the Fresno offensive line blistering the front for the Knight defense. If Rutgers loses the turnover battle, they will lose the game. If Teel can get the ball to a very talented receiving core, then the Knights could come away with the W.
Chris Sedenka is the host of the PM JAB, which can be heard weekdays between 3-7pm on 96.3FM and AM1440 Sportsradio WJAB in Central and Southern, Maine. He also loves Puppies!